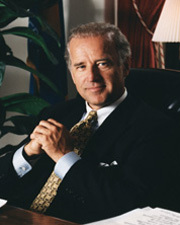 BIDEN, Joseph Robinette, Jr. (Joe), a Senator from Delaware and a Vice President of the United States; born in Scranton, Lackawanna County, Pa., November 20, 1942; educated at St. Helenas School, Wilmington, Del., and Archmere Academy, Claymont, Del. ; graduated, University of Delaware, Newark, 1965, and Syracuse (N.Y.) University College of Law 1968; admitted to the Delaware bar in 1969 and commenced practice in Wilmington; served on the New Castle County Council 1970-1972; elected as a Democrat to the United States Senate in 1972 and reelected in 1978, 1984, 1990, 1996, 2002, and again in 2008 and served from January 3, 1973, until January 15, 2009, when he resigned to become Vice President; chair, Committee on the Judiciary (One Hundredth through One Hundred Third Congresses), Committee on Foreign Relations (One Hundred Seventh Congress [January 3-20, 2001; June 6, 2001-January 3, 2003], One Hundred Tenth Congress); was an unsuccessful candidate for the Democratic nomination for president in 2008, but was elected Vice President of the United States on the Democratic ticket headed by Barack Obama in 2008; reelected in 2012, and served from January 20, 2009, until January 20, 2017. Biden, Joseph R. Promises to Keep: On Life and Politics. New York: Random House, 2007.